What is Queen Bee Eye Cream? Queen Bee Eye Cream is a formulated eye cream that is specially made for the delicate eye area. It has been made with quality natural ingredients. It works effectively in reducing under eye circles, facial lines and wrinkles. This makes your skin exhibit a youthful exuberance. Queen Bee Eye Cream has been carefully hand-made and is a product of one of its kind because it uses all-natural, organic ingredients. The product offers a more radiant and relaxed look when used in the correct way. The quantity package of the product comes in 1 jar. It is perfect for skin care because it has anti-aging and moisturizing properties, and is alcohol and oil free. The exclusion of these dangerous chemicals is important for the health of the skin. Who is the Manufacturer of Queen Bee Eye Cream? Queen Bee Eye Cream Eye Cream has been manufactured by APIVITA Company. The source of inspiration for this company is the rich Greek flora and the holistic approach of Hippocrates towards health and beauty. The company has been manufacturing products since 1979. It is the first Greek company to produce healthy products. 70% of this company’s products are anti-oxidant rich. The company has been doing intensive research on Greek medicinal plants that work together to produce strong antioxidants, anti-inflammatory and moisturizing properties which increases skin vitality. The production of collagen and elastin is also enhanced. The product does not contain Parabens, Silicones, Propylene glycol, Mineral oil, Ethanolamines and phthalates which impact negative effects to the body and might even be cancerous. The product is claimed to moisturize and keep the skin soft and does not irritate the skin. Queen Bee Eye Cream Ingredients – Are they Safe & Effective? Queen Bee Eye Cream Eye Cream contains a variety of ingredients which work effectively to reduce under eye circles, puffy bags, fine lines and wrinkles when regularly used over a period of a few weeks. Organic Olive Oil: Contains the skin’s natural moisture because of its vitamin and mineral properties. Coconut Oil: Removes dead skin cells. Strengthen the underlying tissues by moisturizing the deeper part of the skin. This results in a brighter appearance of the skin. Vitamin K: Strengthens the capillaries under the eye to reduce eye puffiness and dark circles. Other ingredients include Shea butter and Vanilla Essential Oil which all work together for the betterment of healthy skin. What are the Advantages of Queen Bee Eye Cream? It is designed to moisturize the skin and remove* fines lines and wrinkles giving the skin healthy and useful. Does not contain harsh chemicals which irritate the skin. Not even sensitive skin can be irritated. There are no cancerous additives or preservatives contained therein. This makes the product healthy and safe to use. The natural and organic ingredients are carefully hand-made and are safe for use on sensitive skin. What are the Disadvantages of Queen Bee Eye Cream? 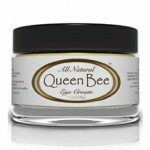 Queen Bee Eye Cream Eye Cream is a little waxy and can result in a shiny appearance in your skin. Using it during the day may, therefore, be quite uncomfortable to some users. Users with types of skin that is prone to acne because it might block the skin pores. This is most especially because of the comedogenic ingredient contained in it. How long does the product take after I order? The shipment takes only one day depending on where you are located. The product can be applied daily (morning and evening). To boost micro-circulation and enhance skin firmness, the moves of the Queen Bee Eye Cream Eye Lifting massage can be applied. As opposed to the fact that Queen Bee Eye Cream might not work effectively with your skin type to give you a youthful radiance. The product can only be genuine if it can reduce or eliminate the dark under-eye circles, fine lines and wrinkles. The all-natural organic ingredients work well in retaining moisture within your skin thus moisturizing it making it smooth. This might actually not be the case with all skin types especially skin types prone to acne. This is mainly because of the comedogenic ingredient that might block the pores. Information on this piece should shed some light on this product before you decide on purchasing it or not.